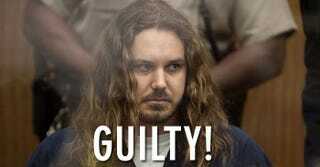 Lead Singer of As I Lay Dying Pleads Guilty... DAMMIT NOOOO!!! The lead singer of one of my current favorite bands has pleaded guilty of trying to hire someone to murder his estranged wife. He was charged last year sometime but I was hoping that he was framed or something but it is no mistake that this guy is guilty. At least I hope the rest of the band can move on because they have really good guitar, drums and melodic backup vocals.